Notes From the Captain Lawrence Tasting Room Shall We Meat For a St. Pat’s Beer? While St. Patrick’s Day has become, for better or worse, a celebration of beer, we sure do some funky things to our beloved brews in the name of the patron saint of Ireland. The purists may have scrunched their noses, but most everyone seemed to enjoy the winkingly-titled Gimmicky Green Ale, colored with algae-type-thing spirulina, in the Captain Lawrence tasting room around this time last year. The brewery has outdone itself this year with Kevin’s Bacon Ale, made of Irish malt, oats, maple syrup and…wait for it…smell it…savor it… Hemlock Hill bacon. The latter ingredient—heck, perhaps all of them—“makes this a perfect breakfast beer,” according to the beer menu. Ryan Kipp’s meaty, malty brew got people out to the tasting room. 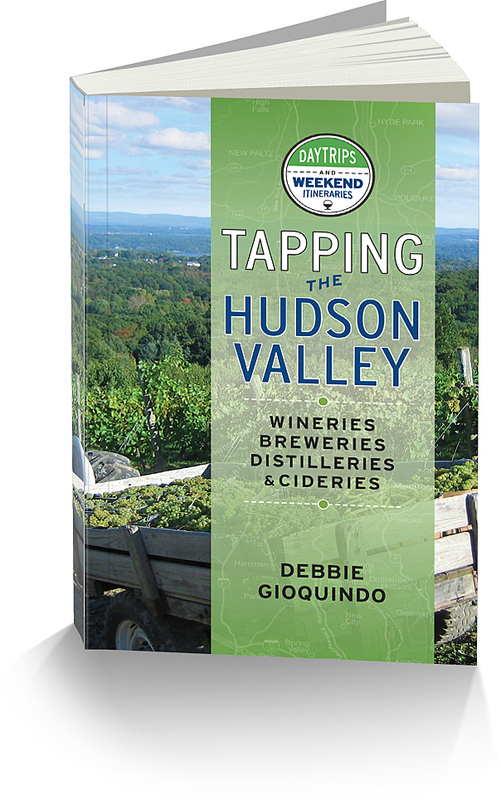 Pleasantville’s Mike Villata, who livened up “Notes From the Tasting Room. Vol. 44”…and “Vol. 70”…first caught a whiff of the Bacon Ale while at the brewery’s Trivia Night a few days before. “I said, I gotta have bacon beer,” he says. It’s hard not to smile when speaking with Mike, who has plastered walls from here to Tipperary with stickers that state, simply, SMILE, part of an initiative he calls “optimistic vandalism.” Today, Mike and Casandra sport “Kiss Me, I’m Smileish” t-shirts. There’s a colorful array of St. Patrick’s t-shirts in the room, even if they’re all green. One man’s shows a leprechaun spewing up into his pot at the end of the rainbow, a fresh take on Irish hurling. One hale fella even sports a Jets’ Tim Tebow jersey. Some team shirts are legitimate throwback jerseys; others simply deserve to be thrown back like an undersized scup. Her pal Ariel Fox—a real mermaid, she says—of Rye Brook has started off with the Sun Block, a savvy choice on a warmish day when people are actually on the patio for the first time in way too long. Her fondest St. Patrick’s memory involves getting hit on by a dude she describes with an unprintable noun, only to have the guy snag the couch she was intending to crash on, thus making him a double unprintable noun. 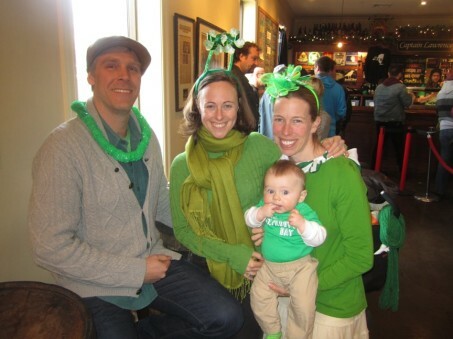 Add in the guy’s gum sticking to the couch, and we’re not exactly sure what made that St. Pat’s quite so special. Christine’s best Erin Go Bragh memories include their group of friends attending the Sleepy Hollow St. Patrick’s Day parade in recent years, causing Ariel’s eyes to go wide as hurling balls. “You guys bitched about it the whole time!” she says. “We had a great time,” insists Christine. They bicker like old pals, pausing to sip their beers. Kristin will cook corned beef and cabbage Monday. But today, she’s dying to check out the band, Burke’s Revenge. “My maiden name is Burke,” she explains. 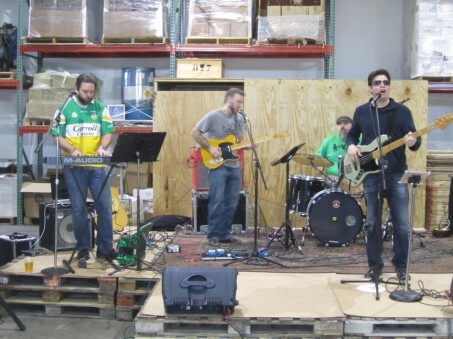 Set up on palates in the brewery room, the band cranks out a hodgepodge of hits stemming from the Emerald Isle. The mood is upbeat. The sun is shining. The party is on. So much so that a gaggle of Pace seniors has skipped the usual spring break sunspots to enjoy St. Patrick’s Day where it’s meant to be enjoyed: New York. Griffin Timony of Rockville Center sips the Amber Rush and Charles Link of Poughkeepsie the Fiona. Rich Voliniof Queens has the Imperial IPA while Grace Bueti of Mount Kisco one-ups him with the Seeking Alpha triple IPA. Asked how the 12% ABV beer is going down, she offers the OK sign and a blissed out grin.